Our Abpromise guarantee covers the use of ab25374 in the following tested applications. WB 1/200 - 1/1000. Predicted molecular weight: 19 kDa. This product has not been tested with paraffin sections. Has a particular type of basic domain (presence of a helix-interrupting proline) that binds to the N-box (CACNAG), rather than the canonical E-box (CANNTG). The C-terminal WRPW motif is a transcriptional repression domain necessary for the interaction with Groucho/TLE family members, transcriptional corepressors recruited to specific target DNA by Hairy-related proteins. 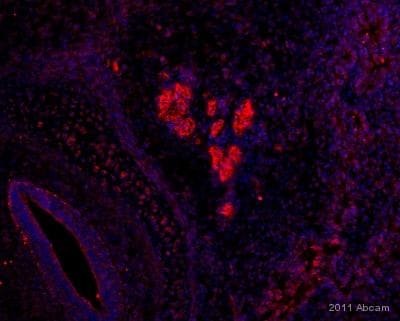 ab25374 staining the cortex of e14.5 mouse embryo by IHC-Fr. The tissue was frozen and cut into 10 µm slices on a cyrostat then fixed and blocked prior to incubating with the primary antibody (diluted 1/100) for 90 minutes. 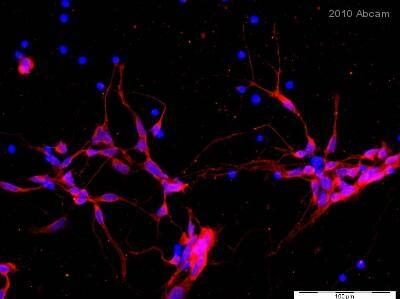 A fluorescent conjugated secondary antibody was incubated with the sample for 30 minutes. HES-5 is shown in red in the nuclear regions; the blue staining is Hoechst nuclear counter stain. Publishing research using ab25374? Please let us know so that we can cite the reference in this datasheet. I would like to ask to you some detailed information about your anti HES5 antibody(ab25374). I've read that it has been tested for Western blot. Do you have the protocol for Western blot that you've used for testing it? I am happy to confirm that ab25374 is tested and guaranteed for WB with mouse and human samples. I also would like to suggest to use a positive control like mouse embryonic cortex. I hope this information is helpful and wish you a good weekend. Ab25374-this is an ab against nuclear protein. On the datasheet, in the IF staining figure, it seems cytopasmic. Please check and advise. The Uniprot localization of Hes5 is listed as Nuclear (by similarity) to other transcriptional repressors. However, Hes5 is widely expressed in the developing nervous system (Akazawa et al., 1992) and in embryos Hes5 is ubiquitously expressed inside the CNS, especially in undifferentiated cells (http://www.gensat.org/imagenavigator.jsp?imageID=15026). The image shows IF of e14.5 mouse embryo and displays both nuclear and cytoplasmic staining for ab25374. I hope this clarifies the matter.